Sam and I were in Orlando for a conference for work - it was great that we are both in the same industry so we could attend the same conference! We went out a day early so we could go to Disney World since I've never been there (pretty deprived, aren't I??) <-- just kidding, Mom!! :) Except ........ I was soooooo sick almost the whole time we were there. I was one of the millions of Americans who have the "Upper Respiratory Illness" (Bronchitis) that has been plaguing the nation this month ... which then turned into a sinus infection. Have you ever been on an airplane with a sinus infection? Well, it's AWFUL. You would think that "descending" is an hour long process. I knew it was going to be bad, so I raided our medicine cabinet and found some VICODIN from when Sam had his uh....."surgery" last year and took that, plus Sudafed ... and I was still positively miserable. Let's put it this way, I was asleep by 8:00, and poor Sam was stuck watching the Flyers game on Yahoo. So...no Disney for us. :( I finally started feeling a little better by the time we left on Tuesday and flying home wasn't nearly as bad. However, now everyone in my house is sick with the same thing, though hopefully they're on the mend. Since it's viral there isn't a lot the doctors can do so they've just got to wait it out and keep taking OTC stuff. I've been walking around with the Clorox Anywhere spray like a freak trying to kill all the germs, and I had our cleaning lady clean all the bathrooms with pure bleach the last two weeks. No other real news except Zach starts soccer this coming week. His team is called "The Burn" (no, we didn't pick that - very strange name....) and their jerseys are all black. He's number 22 and there are 5 other kids including 2 little girls on his team. 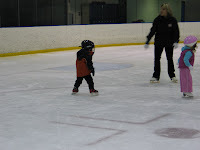 They start practice on Thursday and in case I didn't mention it before Daddy (Sam) is the coach. I'm going to see if our Nanny can watch the girls on Thursday so I can tag along and take some photos. We have to get him his little cleats tomorrow. Heeheee. 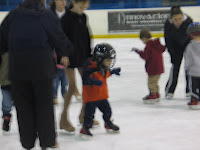 He's still doing good with his ice skating (oh, sorry ...HOCKEY) and he's starting to slide a little on the ice now, rather than just walking. I'll try to have Sam get a video of him next weekend. I should mention, though, that some of our trees have flowering blossoms on them now - just a week after this, and the daffodils in our neighbors yard are coming up. Funny.....would never see that in the Midwest!!! Well ya'll have a good evening.....hope you're well and keeping warm! I'll start with a Dave Slagle update, since many of you have been kind enough to keep him in your thoughts - Dave is hanging in there ... he is on the list for a liver and his status moves up and down by the day. Please continue to keep Dave on your prayer list ... hopefully (this sounds kind of bad?) a liver will come his way soon and he will start the path to healing. The only other real news is that I signed Zach up for pre-school this week. He'll start in September and it's a 4 days per week program. That will be good since it will prepare him for Kindergarten which he will go to - NEXT YEAR (2009!!) Holy crap! Yes, when I was registering him I ran into a friend of mine and we got to talking about how old Zach and the twins would be when they all went to school and we both thought Zach was going to be late because of his late September birthday ... but - the cut off is September 30th. You have to be 5 by September 30th. Zach will be 4 this September 22nd, and 5 next Setember 22nd .... so essentially he will be starting Kindergarten when he is 4. YIKES! I swear he was just born!!! Anyway, hope you are all well...we're doing good here and I just wanted to stop in and say hello! Guitar Hero tennis elbow. It's TRUE! I wanted to tell you all before I forgot.....I finally got the Cortizone (spelling?) shot in my left elbow today that has been bothering me so bad since we got the game Guitar Hero, as I know I have probably complained to you all about a thousand times. I think I should write a letter to the makers saying there should be a warning of the potential bodily damage the game can cause! :) Heheeee!!!! Funny, but I feel (as quoted by Paula Abdul) one million percent...better! As most of our friends and family know, our little Pacifer lover also does not want to stick around in his bedroom all night long. Eventually he makes his way into mommy and daddy's room, and hogs the bed, so that mommy gets about a 1/4 inch. Well Momma's not that skinny folks! I'll keep you posted how this works. NOT ideal (IDEAL perfect world would be for kids to WANT to sleep in their room - I mean he's got a TV that he can operate (start and change DVD's and everything) a lamp that he can use, tons and tons - oh I mean PLENTY - of toys ... ) but better than sleeping with us in our Queen size bed. Hopefully he grows out of this stage soon. He's going to need to get a real size bed in the next year or so (he's still sleeping in his crib turned toddler bed - but he seems to be growing like a weed) so we're going to get him a bunk bed. Maybe he'll think that's cool enough to want to stay in his room. Who knows. Have a good night.....going to be a busy weekend for us, not sure if I'll get to post. Hope ya'll have a good one! PS: To my friends and family in the midwest, sorry about your crummy weather. We've had 70's and 80's here all week, but I'm told it's going to get colder. 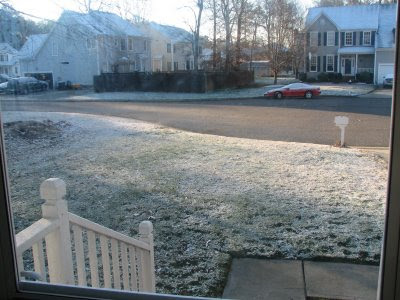 So I know you all want to share your weather with me ... but please, no need. I told Zach if we found all the Paci's around the house and put them in a box we could go to Toy's-R-Us (his favorite store - he can pretty much tell you how to get there) and we would put the box on the shelf in exchange for any toy he wanted. I said wouldn't you like to get a really cool hand-held video game (he's REALLY into computers and Daddy's PS3 all of a sudden) like your big brother, Ben. (I'm thinking the Leapster would be great for him....especially in the car!!) He thinks for about a half a second and says, "no Mom, we have plenty of toys." 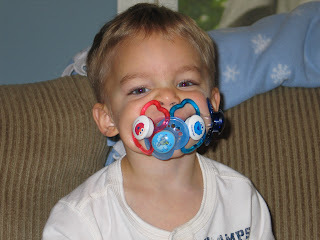 So in lieu of a new toy - a really cool video game toy - he will keep his paci. Sometimes kids say the funniest things. What am I gonna do with this child??? He'll be the only kid playing hockey with a pacifier in his mouth! 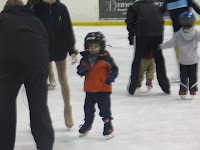 (Of course, we don't let him use it when: he goes to his ice skating practice, when we go to a store or restaurant, when we go outside to play, when he is on the computer or playing PS3 with Dad.) Is putting a dash of tabasco sauce on the paci cruel and unusual? I've always thought that might work. Hmmmm...................... Any other suggestions? I do love how cute and funny and silly they are. It's so amazing to see identical twins be so different...you just would never think they would be. Avery is so serious most of the time, and she loves to just do her own thing. If you notice in most of the pictures she isn't smiling - she's just ... more serious. Addie always looks goofy. LOL. Avery loves to snuggle and is a very thankful baby who knows her manners VERY well....although she is a little DEVIL ... LOL. She is seriously the one who tests us most of the time, and I think she is the one who is going to get her brother and sister in lots of trouble!!! Addie is the fun loving, posing, happy-go-lucky baby who just pretty much does what you tell her. She gets caught at everything bad thing she does!! It's just amazing to see the differences between the two especially the older they're getting. Physically it's getting harder to tell them apart, but you can usually tell them apart by their mannerisms. Anyway - they had a lovely day being spoiled by their mom and dad.....brother and Nana (who bought them their baby buggys) and Grandma who got us all set up with adorable summer outfits I can't wait to put on them! Oh and their nanny, Caitlin, bought them an indoor/outdoor trampoline ... they LOVE it! I'll get some pictures of them on it tomorrow! Very cute! I know we all have our political differences....but I found this website and thought it to be rather funny. In particular, there is a quiz, I'm posting the link below as to "which candidate is right for you ... based on your personality". TOO FUNNY! Anyway, this is Comedy Central's "Indecision" website as I'm ....unfortunately.....still rather undecided at this point. I've caught bits and pieces of the debates, but have not heard not enough, in my opinion, to make any real judgements or opinions. I've heard zillions of rumors and stories about ALL the candidates (both for and against) ... so it's going to be a tough one for me this year. Anyway, thought you might like this site, and the blog is a hoot...typical Comedy Central fashion! I don't know if this will help me - or any of you - make your decisions, but it sure will give you a couple of laughs!!! Oh I forgot to mention, they're MY little stars! Yes, my little girlies sure like to get their groove on! :) Here's some video from last night!! Heehee!! They practiced standing and touching their toes, and marching ... (and I'm not entirely sure what else because I wasn't there, and Sam's sleeping now otherwise I'd ask him again...lol!) Anyway .... here's some pictures. They're cute, but a little fuzzy - unfortunately. Afterwards, Daddy took Zach to the toy store to get him a new monster truck .... that's what they did the first week when they went and the practice was cancelled so Zach was kind of bummed out.....and now it's become the "ritual" ...so that was fun for Zach. Yes, they are two. Well, almost. 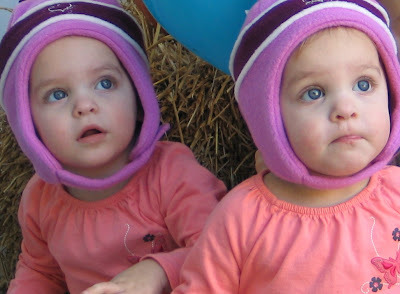 The twins are going to be two tomorrow. We have such a busy day planned I probably won't be able to blog so I thought I'd take a minute and do it now. 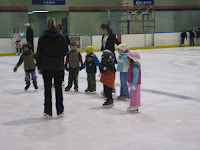 We have Zach's hockey-skate-practice at 8:30. They have a birthday party at the "Jumpin' Monkey" at 10:00 (should be great...wear them all out) ... then we're having a family party for the girls around 4:00...5:00. I can't wait to post a picture of the cake I ordered for them! It is soooo cute!!! They're getting clothes and lots of baby doll stuff......I can't wait. (Of course, I did find 3 new CARS cars - Darrell Cartip, the Pace Car and Fred - to give to Zach - so he doesn't feel totally left out......LOL!!!!) <-- found 'em today, Sam!